An update from Department of Languages, Literatures, and Cultures alum Adam Chambers ’06, who earned his B.A. in German from Illinois State University. “I began studying German in junior high and had an interest in foreign languages, although I did not know at that time that it was the field I would end up pursuing. Being originally from Normal, I had the opportunity to enroll in college-level German courses at ISU as a high school junior, and I took two 200-level courses, one on literature and another on composition. During my senior year of high school, I traveled to Stralsund, Mecklenburg-Vorpommern, in Eastern Germany on the Baltic Sea Coast. 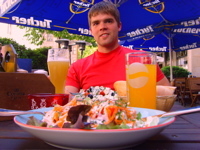 The exchange began with a group of Americans together at an orientation, and it quickly became clear that the coursework I had done with the German professors at ISU had given me a tremendous advantage in rapidly being able to speak and understand the language fluently and hence concentrate on learning more about the country’s culture. When I returned from Germany, there was no question that German was what I should study. The experience I had with the German professors at ISU was certainly second-to-none. I strongly doubt that any department can claim professors who are as genuinely interested and acute to each students’ specific interests, strengths and weaknesses, and who would offer more encouragement for all students. Considering that my fellow German students and I were frequently so very different in our particular interests, our ideas in what we wanted to use our degree for, and our skills and weaknesses, this is no small task. I never had an intention to teach at a high school level when I first started, and simply knew that German was something I greatly enjoyed studying, which in itself is the best reason to study anything, but the degree to which ISU’s German professors challenged me laid the foundation for the career in academics in the field of German that I am currently pursuing. I received more than just a foundation in German in my undergrad career at ISU, and it is currently helping me as I work towards an M.A. and then a Ph.D. in this same field. I was even given the opportunity to help a professor with his research, performing tasks transcribing 16th-century typescript as well as being exposed to an earlier form of the language; needless to say, this was a valuable experience, the benefits of which I am currently reaping as a graduate student. If it were not for the true teaching and scholarly excellence of specifically ISU’s German professors, I may well have ended up pursuing something else entirely.